General stores had their heyday between 1820 and 1860, when income was rising and the population was growing. . Like the Hope General Store, they generally stood at crossroads. They were informal, though some might say barebones, with bare wood floors, a hodgepodge of goods along wooden shelves, a cat cuddled up by the stove, and smells of apples, cheese, coffee and tobacco. They were centers of town life, where gossip and opinions were exchanged by regular customers. The storekeeper was often the postmaster and provided a link to the outside world. He was likely self-educated from the books and magazines he carried and from his buying trips to big cities, and he was generally well respected. Dozens of the old general stores survive in New England. Visitors often comment they remind them of a Norman Rockwell painting, with a smell of apples and coffee. Nearly three years ago, the Wall Street Journal weighed in on the revival of the general store, calling them ‘one part country store, one part concept shop’ with a personal take on merchandise and serving as an informal community center. We did our best to find the six oldest stores in New England, though old records are sketchy and claims sometimes exaggerated. If you know of a great old general store in New England, please add it to our comment section. 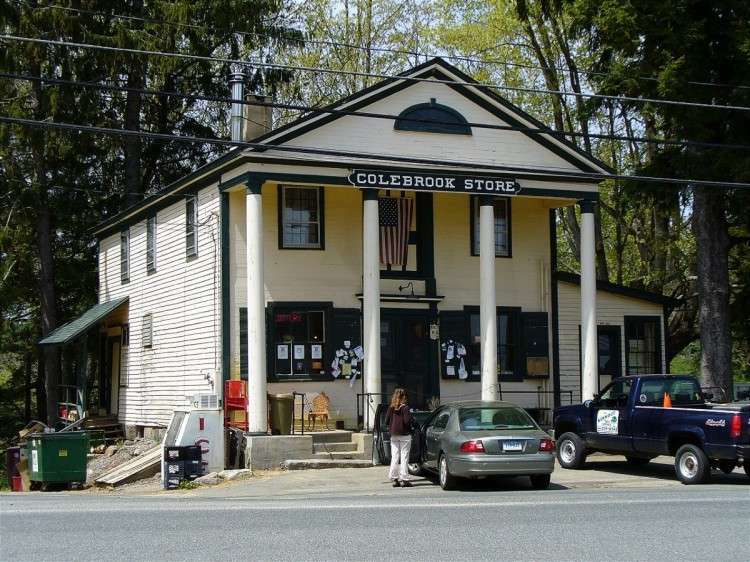 The Colebrook Store is the oldest continuously operating general store in Connecticut. Founded in 1812, it operated until 2007, when it closed down. In December 2014 it reopened under the new management of Jodi Marinelli. The store is just a stone’s throw from Town Hall in the center of Colebrook, a town in Litchfield Country. 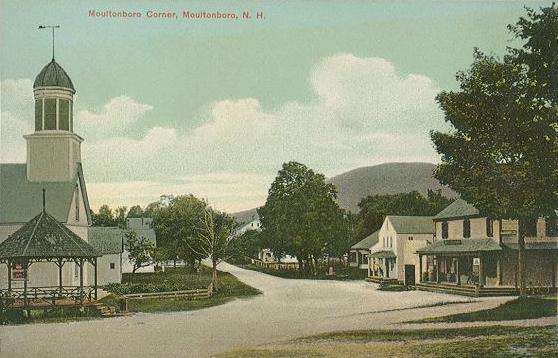 It was owned by Martin and Solomon Rockwell, one of the founding families of Colebrook. Julius Rockwell became a judge and, in 1854, a U.S. senator from Massachusetts. The Rockwells also built the Colebrook Inn, which houses town offices and the historical society. The Colebrook Store changed hands several times. In July 2007, owner Lora Murphy put out a sign that said, ‘closed for vacation.’ She never reopened. In 2003, the Colebrook Preservation Society bought the building for $85,000. Five years later, Marinelli signed a lease on the building and moved with her family into the second floor above the store. Today the store serves breakfast and lunch, and sells groceries, candy, baked goods and knick knacks. It’s located at 559 Colebrook Road in Colebrook, Conn. The Hope General Store in the center of the farming community of Hope on the corner of 105 and 235, outside of Camden in midcoast Maine. There’s a blacksmith across the street and a carpenter next door. It was built in 1832 and has been a Grange hall, an antique store and a post office. Michael and Heather Forcillo put in new heating and cooling systems and a generator when they bought the Hope General Store in 2014. Today they sell sandwiches made with brie and caramelized onion, as well as ham Italians. They offer 140 kinds of beer, including Pabst Blue Ribbon, and champagne. They also sell maple syrup, candles, honey made by neighbors. and for Hope's small British population, tea and specialty candy. You can also get fishing licenses, bait and wi-fi. 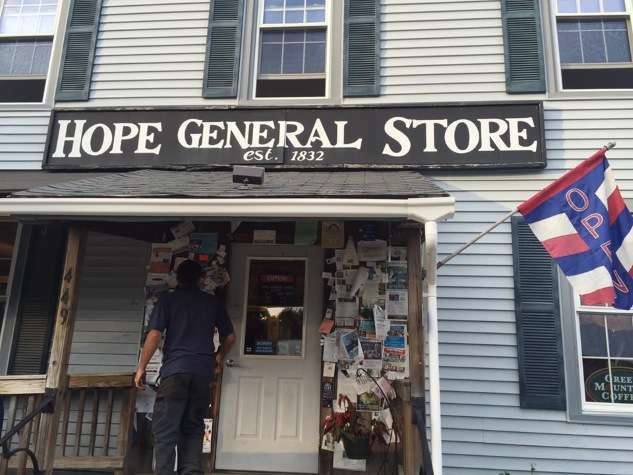 The Hope General Store is at 449 Camden Rd., Hope, Maine. 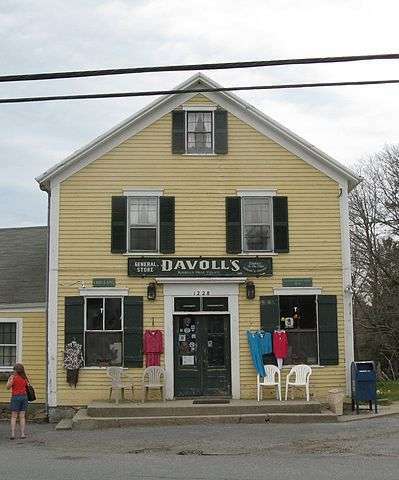 Davolls is at the mercantile center of the Russells Mills historic district in Dartmouth, Mass., down the road from the fire station. Its owners included a series of prominent Dartmouth families: Howland, Russell, Allen, Slocum, Tucker. William Howland bought the building in 1792, and opened a general goods shop. In the latter half of the 19th century it was known as Slocum’s until the Davoll family bought it in the early 20th century. Wilfred and Virginia Morrison and their daughter Beverly bought it in 1974. Wilfred told the New Bedford Standard Times, "We stand around and solve all the problems of the world." The family sold the store in 2016 to Kim Arruda and Jim Chouinard. They are renovating the old building, which is still selling antiques, coffee, pastries, books, clothing, dolls, quilts, Christmas figurines and Dickens’ villages, candy and collectibles. Davolls is at 1228 Russell’s Mills Road, Dartmouth, Mass. The Old Country Store and Museum in Moultonborough in New Hampshire’s Lakes Region may be the oldest general store in the country. The Holden family, which runs the historic store, has records dating to 1781. It has also been home to a library and the post office. Town Meetings used to be held at the store. Town founder Jonathan Moulton was deeded the land on which the store stands for his service in the American Revolution. He sold it to Samuel Burnham, 'with barn frame thereon,' in 1777, who sold it in 1779 to a trader named George Freese. Records show Bradbury Richardson worked for Freese in exchange for goods in 1781. A map of New Hampshire printed in 1784 shows the store as the only building inthat part of Moultonborough. Today it's a Lakes Region tourist attraction. A wooden Indian stands guard at the entrance to the store chockablock with merchandise: bobblehead dolls, coffee mugs, bomber hats, t-shirts, shoes, candles, cookware, maple syrup and toys. 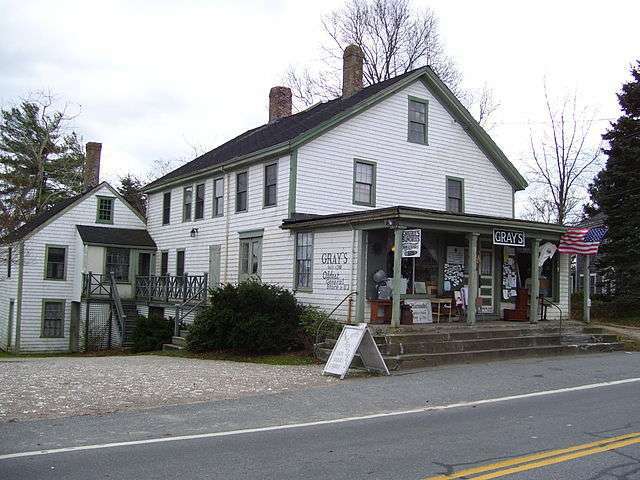 The Old Country Store and Museum is at 1011 Whittier Highway, Moultonborough, N.H.
Gray’s General Store sits in the historic Adamsville district in Little Compton, R.I. It opened in 1788, and in 1804, it opened the first post office in the town. The store was owned by six generations of the Waite family since 1879. Proprietor Grayton Waite died suddenly in 2012, and the store closed, losing its distinction as the oldest continuously operating general store. It reopened a year later as a gift shop and general store after Waite’s son Jonah graduated from college. Today Gray’s sells penny candy and cigars, as it always has, dishes, secondhand books and jewelry made locally. You can still see the old post office. Gray’s General Store is at 4 Main St., Adamsville, R.I. 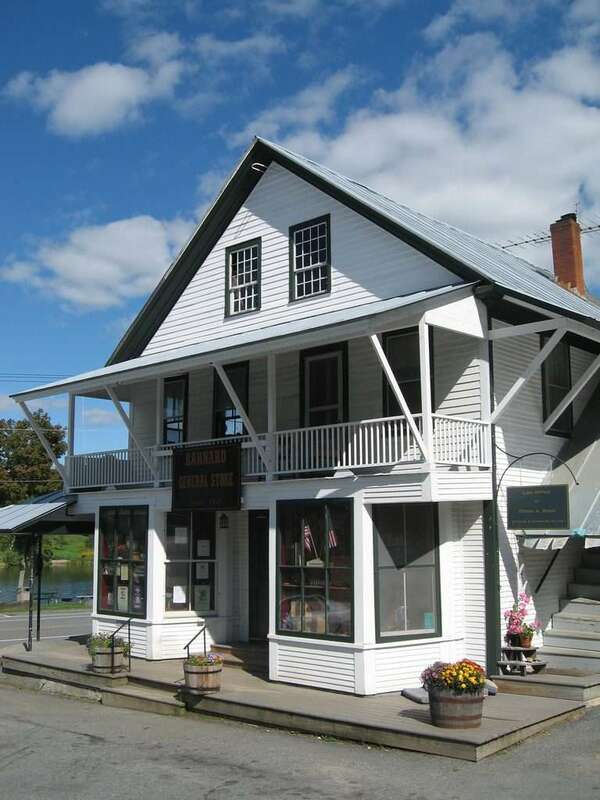 The Barnard General Store is located in the center of Barnard, Vt., on Silver Lake. It opened in 1832 and ran continuously until 2010, when it made national news by closing. Three years later the Barnard Community Trust reopened the store after the town raised $500,000 to save it. A young couple from Long Island, Joe Minerva and Jillian Bradley, now run the Barnard General Store seven days a week. The store serves food, including a country breakfast and deli sandwiches, and sells groceries, beer and sundries. It has a wooden floor, wood-burning stove and a marble soda fountain counter. The Barnard General Store is located at 6134 Vermont Rte. 12. Lebanon CT has The Green Store, near the Green. Not sure how old, or if it qualifies as General, but stop in for food, etc. Great job of keeping the tradition with the Colebrook Store, run by Jodi Marinelli. Takes you back all those years in atmosphere and the wonderful aromas. Guilford country store in guilford, Vermont. Putney general store, putney, vt. Both wonderful. Averys’ General Store (aka: AL Avery & Son)in Charlemont MA has been in continuous operation since 1861 and now believed to be the longest continuously operating general store in New England.